How to get around Rhodes Town? Learn about bus timetables, prices, location of bus stations, Rhodes Airport to City Center ect. How to get around Rhodes Town? Learn about bus timetables, ticket prices, location of bus stations, Rhodes Airport to City Center ect. Rhodes provides all means of transport and offers visitors a chance to get around the island safe and cheap. Buses are the cheapest way to get around the island. Blue buses run between Rhodes Town, the port and the airport. 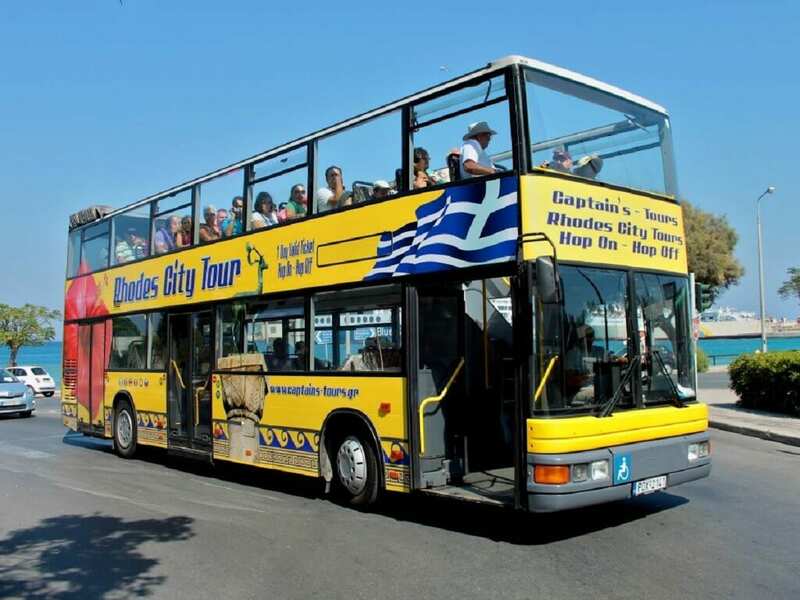 There are also KTEL (suburban) buses that go from Rhodes Town to almost all villages and beaches around the island, particularly to the most tourist places, like Lindos, Faliraki, Afandou, Archangelos. Two bus terminals, a block apart in Rhodes Town, serve half the island each. There is regular transport across the island all week, with fewer services on Saturday and only a few on Sunday. Pick up schedules from the kiosks at either terminal, or from the EOT (Greek National Tourist Organisation) office. The Eastern Bus Terminal has frequent services to the airport (€2.40), Kalithea Thermi (€2.20), Salakos (€4.30), Ancient Kamiros (€5.20) and Monolithos (€5.20). From the Western Bus Terminal there are services to Faliraki (€2.40), Tsambika Beach (€3.90), Stegna Beach (€4.40) and Lindos (€5.20). In Rhodes Town, local buses leave from the urban bus stop on Mandraki Harbour. Bus 11 makes a circuit around the coast, up past the aquarium and on to the Acropolis. Bus 2 goes to Analipsi, bus 3 to Rodini, bus 4 to Agios Dimitrios and bus 5 to the Acropolis. Buy tickets on-board. KTEL also opearates the long distance transportation of the East Side Area (Faliraki- Kalithies- Psinthos- Afandou-Kolymbia- Archagelos- Haraki- Malona- Massari- Lalathos- Pilona- Lindos- Pefkoi- Lardos- Laerma- Kiotari- Asklipio-Gennadi- Vati- Profilia- Istrios- Apollakia- Arnitha- Lachania- Mesanagros- Kattavia- Prasonisi). D.E.S “RODA” operates in the Urban area (city of Rhodes), the suburban areas (Koskinou- Faliraki- Ixia- Filerimos Ialissos- Kremasti- Pastida- Maritsa- Paradisi) and the interurban regions of the Western Side of the island of Rhodes (Damatria- Theologos- Soroni- Dimilia- Eleousa- Archipoli- Platania- Apollona- Fanes- Kalavarda- Ancient Kamiros-Mantriko- Kritinia- Salakos- Embona – Agios Isidoros- Sianna- Monolithos). Taxis are extensively used in Rhodes, as a fast mean of transport. There are many taxi ranks around the town, mostly outside the port, the airport and in central spots of the city. Taxis are usually avoided for their high cost but they are the fastest solution. Usually fixed rates apply for tourist spots. The easiest way to explore the island is not with the public transportation where you have to keep to the schedule, but with your private vehicle. There are many car rentals all around the island, particularly in Rhodes Town, Faliraki, Lindos, Afandou, Ialyssos and the other tourist spots. Rhodes has good road network with asphalt roads to reach every location. It is advised to book in advance because the demand is high, especially in July and August. Boats depart daily from the old port of Rhodes Town and go to Lindos or for trips around the coastline. There are also daily boat trips to Symi island. From the new port of Rhodes Town, ferries and hydrofoils depart to Marmaris, Turkey. From the small port of Skala Kamirou, there are daily boats to Halki island.